Will The Disney and Fox Deal Kill Future 20th Century Fox Theme Parks? TPU Reader Enzo writes in to ask, “Hey any news on how the Disney buyout will affect the planned fox studios theme park in Miami?” Thanks for the question, Enzo! To be honest, I totally forgot about the Fox Studios Theme Park that was proposed for Miami. Back in 2015, we ran a story about how a developer in Miami wanted to build a theme park and water park complex using 20th Century Fox film franchises. 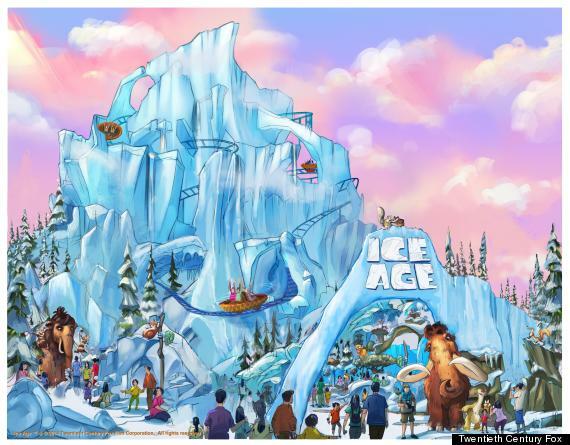 To be clear, this is not the actual studio who was looking to build this park, but rather a developer who acquired the rights to studio films such as “Ice Age,” which would admittedly make for a pretty cool water park theme. Unfortunately, it seems that the park in Miami (known as Miami Wilds) is dead in the water. There are many environmental concerns that have been raised and their official Twitter account hasn’t posted anything since 2015. I wouldn’t hold my breath on this moving forward. Meanwhile, you can certainly ask the same question about 20th Century Fox Malaysia which is already under construction. As of right now, that park is scheduled to open by the end of 2018 (though it seems like it will be delayed again). Even so, let’s say the Disney acquisition of Fox will take place by then or even shortly after the park opens. Can they come in, plant a Disney flag and shut the joint down? Not at all. Keep in mind, when it comes to most movie studio based theme parks outside of Disney and Universal, the movie studio doesn’t actually own the park. Rather, they are being licensed by an outside developer who acquired those rights long ago. So in this case, the developer for both the Miami and Malaysia parks acquired the rights to the 20th Century Fox catalog back around 2013 or 2014. Just like other Disney acquisitions, those companies still exist such as Pixar, Marvel, Lucasfilm, etc. Which means it doesn’t void the contract for the people who already own those theme park rights. Moving forward does this make it harder for developers to acquire 20th Century Fox theme park rights once the Disney acquisition goes through? Absolutely. However, those already either under construction or in existence are legally bound to keep operating. A contract is a contract, regardless of who the parent company is. Thanks for the great question! This entry was posted in Theme Parks 101 and tagged Fox Studios Park Malaysia, Fox Studios theme park, Fox theme park Miami. Bookmark the permalink. Trackbacks are closed, but you can post a comment.